Malachite, with its beautiful, rich green color, leaves no doubt of its importance as a jewel. Its opaque strength and power demands respect, mesmerizing the viewer. Yet the movement, flow and energy in its lines, circles and designs soothe and welcome. It is spiritually inviting. Malachite must be handled with caution! We must again warn you: use only polished Malachite. Do not use any Malachite elixir. Do not place any malachite in your mouth. If you use this stone, use common sense. Place it on the body with a small cloth under it. It's healing powers will not be diminished. With its pure energy rays of green, Malachite is dedicated to the Heart Chakra. Located near the center of the breastbone, it regulates our interaction with the external world and controls what we embrace and what we resist. It gives us the balancing ability to be ourselves within the environment. When the heart chakra is out of balance you may feel either controlling or controlled in a relationship, and become critical of the little foibles of others. You may well find yourself having inappropriately strong emotional responses to everyday external stimuli. Malachite, with its pure Green Ray of Influence, is a "growth crystal" - a powerful conduit of the earth's Life Force of birth, development, and creation, and of the power of nature's constant renewal. It is a potent aid in nurturing, whether of fledgling family relationships or a new business venture. Green talismans are perfect for keeping a venture on course, a project on schedule, and life on track. Lighter Malachite crystals promote spiritual growth and renewed commitment to a higher purpose. Those of a darker hue are talismans of physical growth and strength, and safety in travel. Some practitioners have used Malachite in meditations to get in touch with the Earth Mother. Holding one and sitting quietly on the ground for a few minutes helps many people to be more aware of the earth as a living organism upon whom we are totally dependent. If your birthday falls in any of the following periods, a Malachite can be a valuable conduit to your Guardian Angel. The table also provides the name of the Guardian Angel of those born in the time period. There are other Angels that are partial to Malachite. The table below gives you the information about them. Malachite honors Hathor, the Egyptian Goddess of Joy and Fertility. She is often honored as a special Goddess of Musicians, and as the "Lady of Malachite" she is the patron of Egyptian miners. Azurite/Malachite honors Isis, the Egyptian Goddess of Life, the most important goddess of Egyptian mythology. She is widely honored as a Goddess that brings the power of the divine feminine. Malachite and azurite bring together the green of the earth and the blue of the sky, as Isis is the daughter of Earth and Sky. Crystals of green also honor Persephone, the Greek Goddess of Spring. She represents celebration and the Earth alive with new growth. 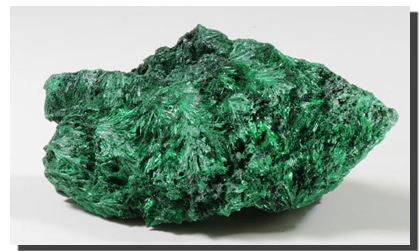 Malachite is not the traditional birthstone of any month. Malachite, with its beautiful green color, is one of the natural birthstones for those born in mid spring (20 April - 20 May). Green crystals bring you renewal, success in new ventures, and good health. Malachite is one of the zodiac stones for those born in the heart of spring, under the sign of Taurus, from 20 April - 20 May. Taureans are known for being "down to Earth," the doers and the realists. They are affectionate, known for their tempers and very stubborn. Malachite is a Guardian Builder Crystal. The Guardian talismans do not reveal their inner strength. These stones rarely, if ever, form transparent crystals. Rather, they hide their strength behind an opaque mask, obscuring the power they possess. In the physical world they are fantastic amulets for protecting your loved ones, your possessions, and your physical security. Combined with the Earth Power of a Builder, these crystals are perfect aids in building up wealth, or improving our lot in life both materially and spiritually. They help in development efforts, in learning new skills and knowledge, and in building new relationships. Malachite utilizes Wood energy, the energy of growth, expansion, new beginnings, nourishment and health. It enhances vitality, brings abundance, and keeps us growing physically. Use green crystals to enhance any space used for eating, in the room of a small child, or in a place of your home where you are beginning a new project. Wood energy is traditionally associated with the East and Southeast areas of a home or room. It is associated with the Family and Health area, and the Prosperity and Abundance area. Malachite is one of the oldest known stones, used for thousands of years for its healing and transforming properties. In ancient Egypt, Malachite was used by the upper classes as one of their main power stones, serving as a grounding force to help them channel higher energies onto the planet.